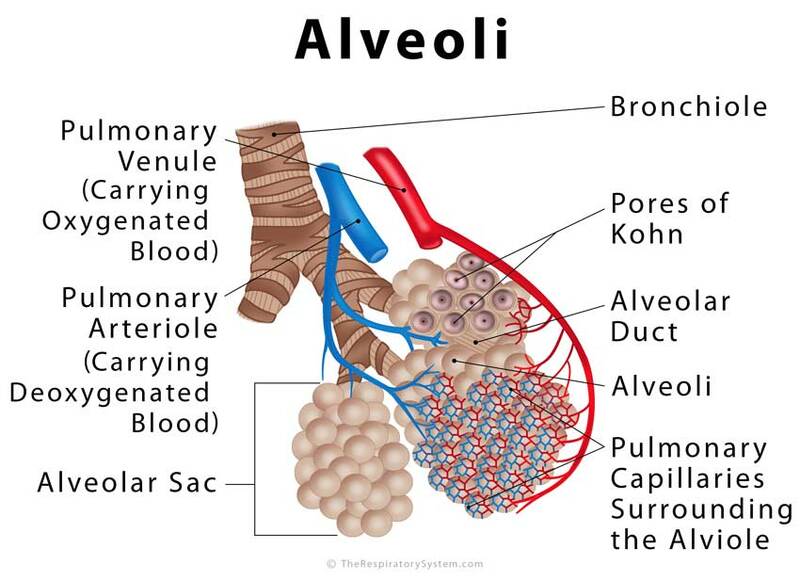 Alveoli are the small balloon-like sacks of 200-500μm diameter , making up a vital part of the respiratory zone of the human lungs. Each alveolus (singular) plays an important role in letting oxygen and carbon dioxide move into and from the bloodstream during inhalation and exhalation [2, 3]. The alveoli are all interconnected with each other, forming the final part of the bronchial tree. 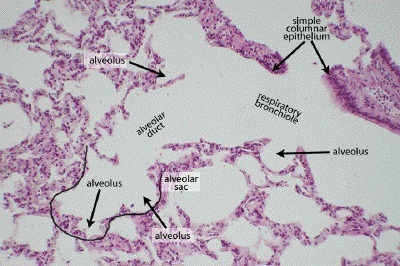 Originating from the alveolar duct located at the end of each bronchiole , there may be multiple alveoli arising from a single duct, often existing in clusters . In a healthy adult, the number of alveoli in the lungs ranges from 400 million to 700 million [1, 5]. The balloon-shaped alveoli cover approximately 70 square meter area within the lungs, with this wide surface area contributing towards a more efficient gas exchange . The one-cell thick walls of the alveoli are composed of two distal airway epithelium cell types (pneumocytes) . Type-1 squamous alveolar epithelial cells: Constituting 95% of the alveolar surface area , the type 1 cells are extremely thin and flexible to help in the process of gas diffusion so the oxygen-carbon dioxide exchange can occur between the alveoli and the capillaries. However, these cells are quite vulnerable to injury as they are unable to undergo mitosis (cell division) . Type-2 great alveolar epithelial cells: The rest of the 5% of the alveolar surface area is covered by large, cuboid to round type-2 epithelial cells, responsible for secreting pulmonary surfactant  so the lungs can maintain their elastic recoil property. Even though occupying a small area, type-2 epithelial cells outnumber the squamous cells , accounting for 60% of the total number of alveolar cells , and are capable of mitosis to produce new type-1 cells for replacing any damaged ones . There is an extracellular matrix, a narrow fluid-filled space, surrounding the alveolar clusters to help the individual sacs to stay in their place and function independently . A thin membrane, across which the O2-CO2 exchange takes place, the respiratory membrane is composed of the squamous alveolar epithelial cell, and squamous pulmonary capillary endothelial cell, and their fused base membranes . The respiratory membrane, the only barrier between the oxygen-rich air within the alveoli and the carbon dioxide-rich blood carried by the capillaries, is about 0.5μm thick as opposed to the 7.5μm-diameter of blood cells traveling through the capillaries . 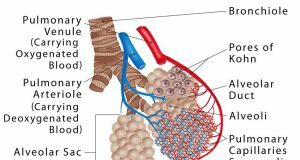 The alveoli are surrounded by a fine network of blood capillaries that are supplied by small pulmonary artery branches . These capillaries carry the CO2-rich blood to the lungs to exchange them for O2. There are small passages or pores in the alveolar walls to serve as a connection between adjacent alveoli . Being around 10μm in diameter, they let the air to pass between individual alveolus and function as an alternate route for air in case of an obstruction . These pores are bordered with irregular reticular elastic fibers . Some alveoli do not participate in the process of diffusion due to some damage, like an infection, scarring, or a weakened respiratory system due to age or some medical procedures . Oxygen present in the air that reaches these regions does not get exchanged with carbon dioxide. These areas are called alveolar dead space . There are numerous macrophages (a white blood cell type) that move through the spaces between the air sacs to keep the lungs clean of any dust or debris that may have entered the lungs during inhalation, preventing any infection . The human body needs oxygen for every important cellular function, and when we inhale, we draw in this essential gas from our environment. But once the air enters the body, the gaseous oxygen needs to reach the bloodstream so it can be sent to each cell in the body. Also, the carbon dioxide produced by the body due to cellular respiration needs to be excreted through the respiratory system, and for that, the CO2 needs to reach the airways from the blood. Both of these are carried out in the alveoli . Every time we breathe in, the inhaled air travels down the pharynx, larynx, and trachea into the bronchi, entering the lungs through the bronchioles to reach the alveoli . The alveoli are adapted for gas exchange with a large surface area, with each alveolus having a 1-cell thick wall, and numerous capillaries covering it . These capillaries are also 1-cell thick , leaving a barrier of less than 1μm between the oxygenated air and bloodstream . 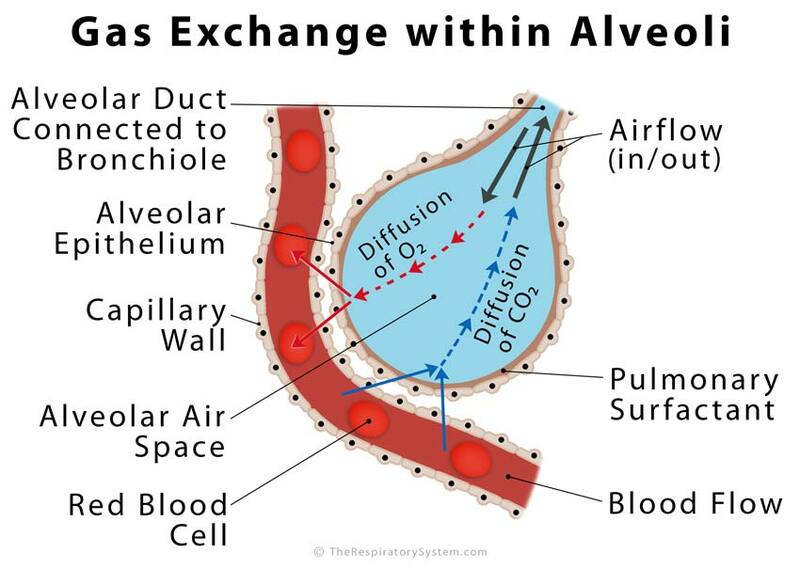 The O2 and CO2 exchange in the alveoli occurs in the process of diffusion, where gas moves from a high-pressure area to a low-pressure one to equalize the air pressure in the two regions without any external force or energy . When the inhaled air reaches the alveoli, the oxygen passes into the blood due to a low partial pressure of oxygen in them. On the other hand, carbon dioxide passes into a low CO2 pressure region in the alveoli from a high CO2 pressure region in the capillaries [22, 23]. The primary purpose of the type-2 alveolar cells is to produce surfactant, a fluid that lines each alveolus, helping to maintain their shape and surface tension , keeping them from collapsing during breathing. This surface-active lipoprotein complex works in accordance to Laplace’s Law of surface tension to maintain the elastic recoil of the alveoli, the smaller bronchioles and in turn, the whole lungs [3, 6]. Atelectasis: A respiratory complication, often occurring after major surgeries that need anesthesia, atelectasis means a partial or complete collapse of the lungs due to deflation of the alveoli. Symptoms include coughing and shortness of breath, with the problem going away on its own in minor cases, once the alveoli start functioning normally as the effect of anesthesia wears off. Serious cases with underlying conditions like a blood clot or tumor may require surgical intervention . Emphysema: One of the two disorders collectively referred to as chronic obstructive pulmonary disease or COPD, emphysema is a progressive respiratory disease where breathing becomes difficult due to hyperinflation of the alveoli , where they no longer function properly. This eventually makes the sacs to lose their elasticity, leading to permanent breathing problems . This alveolar enlargement is common among smokers, with treatment including medications, oxygen therapy, and breathing exercises . Pneumonia: An acute bacterial or viral respiratory infection that causes inflammation along with fluid or pus buildup within the alveoli (edema) [29, 30], interrupting the process of oxygen intake, making it difficult to breathe. Treatment of this potentially life-threatening condition usually includes the use of antibacterial medicines . Pulmonary Fibrosis: An idiopathic condition characterized by damage, hardening, and scarring of the air sacs and the lung tissues surrounding them, it is characterized by chronic breathing difficulty that worsens over time. It is usually treated with medications and steroids, but rare, severe cases may call for a lung transplant . Rupture of Alveoli: This can occur as a complication of a general anesthesia where the treatment or management depends on the underlying cause and any associated conditions present . Alveolar Capillary Dysplasia (Congenital Disorder): Alveolar capillary dysplasia, where the pulmonary veins are misaligned at the time of fetal development, is a rare congenital malformation that leads to severe, potentially fatal breathing problem within hours of birth, with the condition having almost 100% mortality rate . Good description of all parts of lungs and their functions.